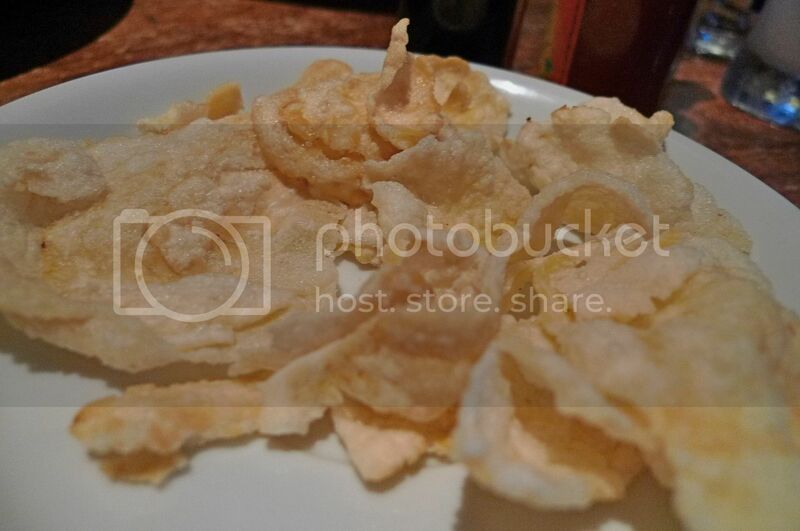 My Very First Blog: Why I Must Dine at Dirty Duck Diner Again! huhu too bad u guys didn't get to taste the smoked duck.. oh i like the ambience of the restaurant! 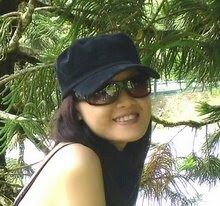 hi foong, i am early this time! 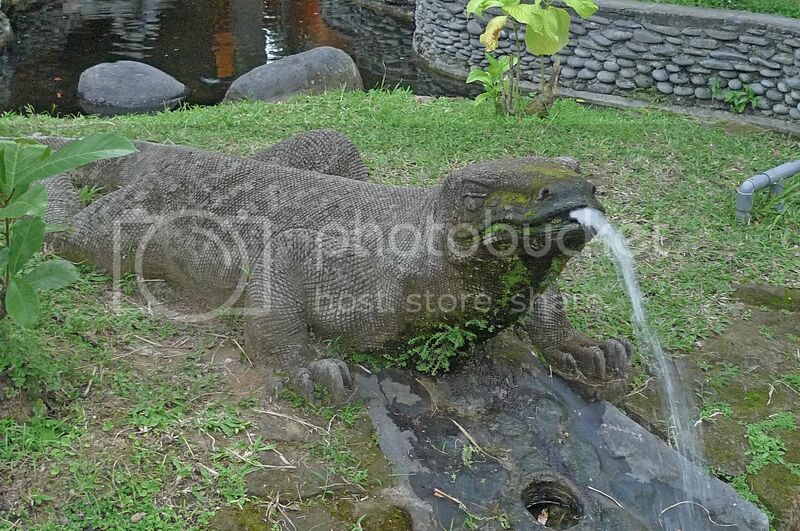 that's huge for an iguana so it looks more like a giant "bayawak" or can be a comodo dragon. the places you visited were great! the food here doesnt look so authentic.. more for the "foreigners".... i still love the guling babi... must try when i go next time! the clouds... looks like it's gonna rain or maybe it's afternoon already..
the temple looks great... is a temple? 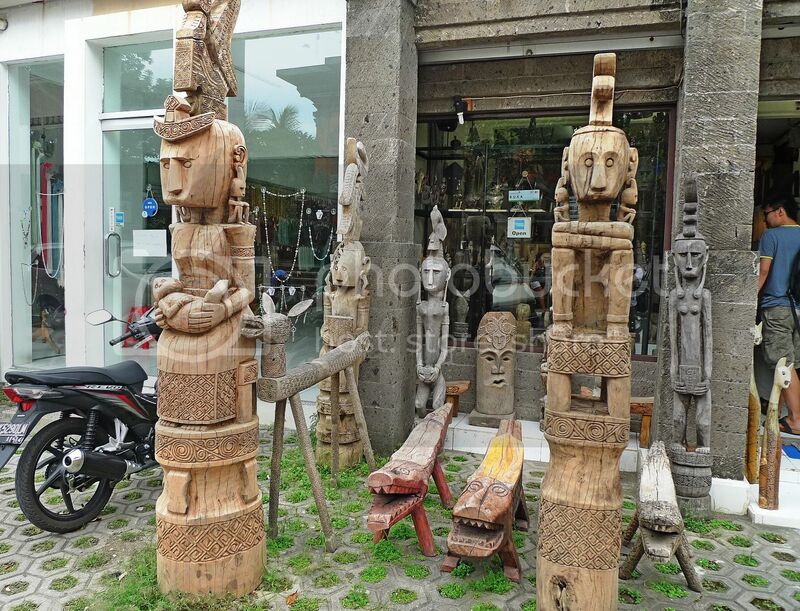 coz it's the same with what i saw from some Chinese films..
love those wooden sculptures.. hahaha so it's forbidden to take photos of these... i guess it is better if you took a snap shot of that man who forbid you haha and make him an instant celeb here in your blog..
why Dirty Duck? is it literally dirty haha or just a term given to the dish? have a great day foong... by the way have you seen my recent post... sorry for using your name without your permission by the way,.... oh i think you will love them.. I think our roast duck is better! :) I like tender and juicy duck meat. There's a good one at D'sara Uptown (where there's a stall that sells Hokkien mee in the same restaurant). 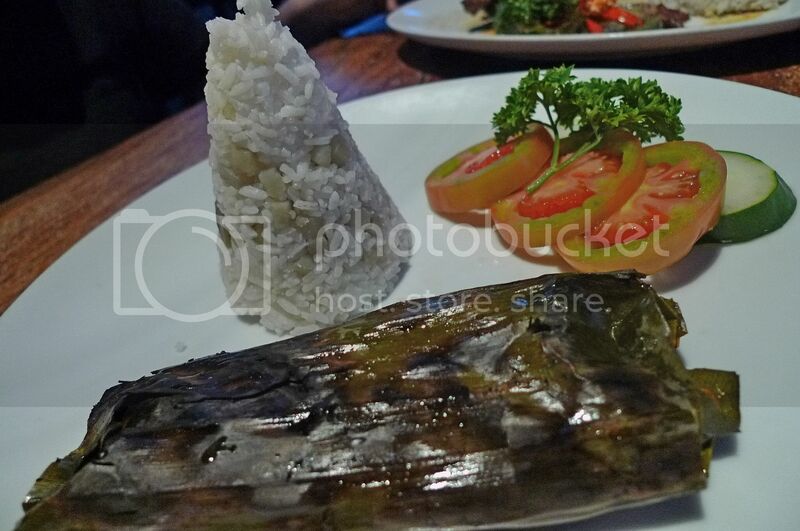 Shall remember your tip on making reservation and ordering the smoked duck before visiting the restaurant..if I do travel to Bali. The reptile is probably a Komodo Dragon. 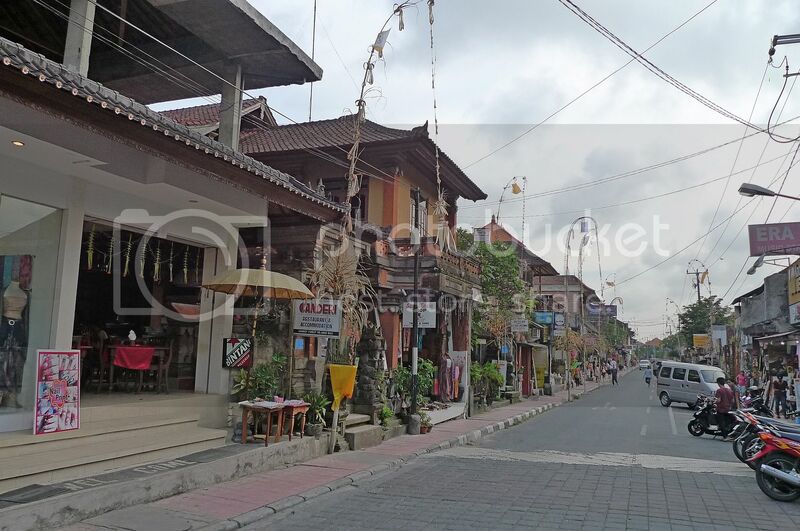 Ubud was my favorite place. Despite being a popular tourist destination, it remained peaceful. I miss it! 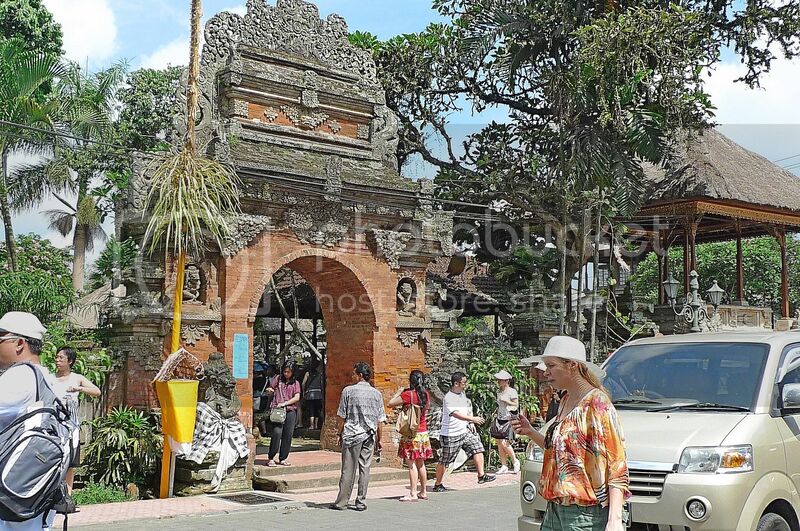 I agree with Khengsiong - that probably is a komodo dragon statue. So much greenery there! 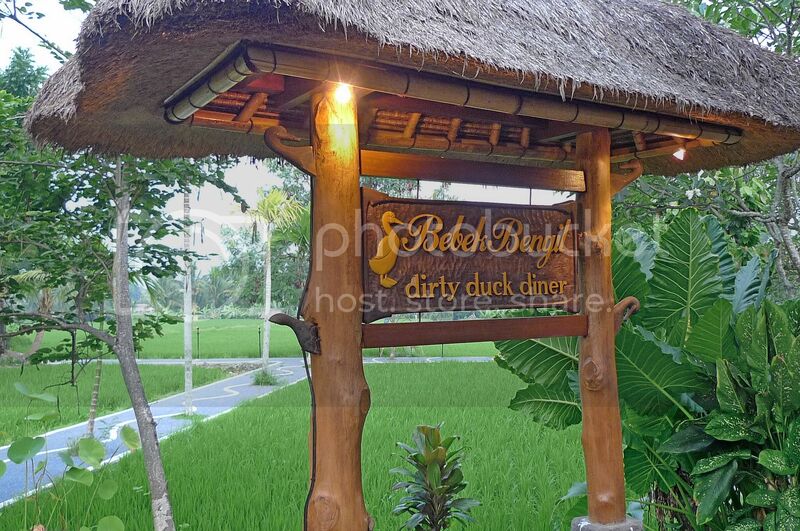 They actually have paddy fields right at the doorstep of the diner? Cool! Great name 'dirty duck' which is very catchy. Looks like you spend quite some time there. Photos of the sign board were taken one in the daylight and the other at night. 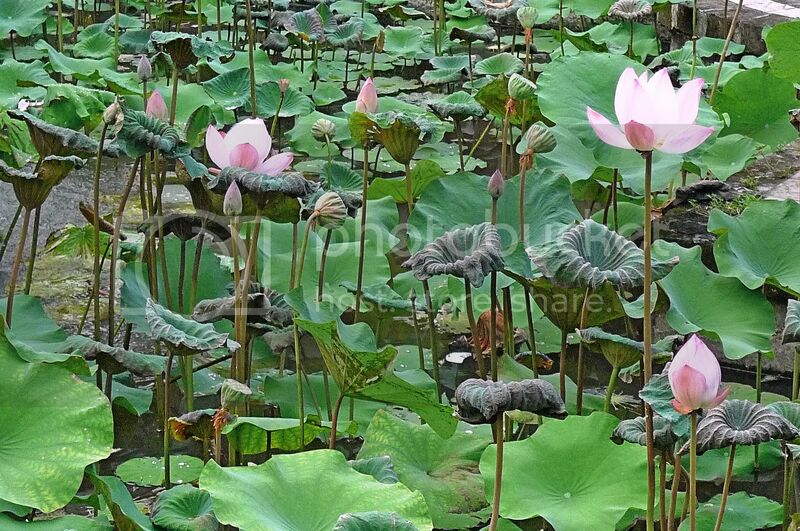 Love the lotus flowers so nice. Yeah saw the two ducks in the photo. That's more of an iguana to me. Cool place to have the crispy duck. Sorry missed your smoked duck. 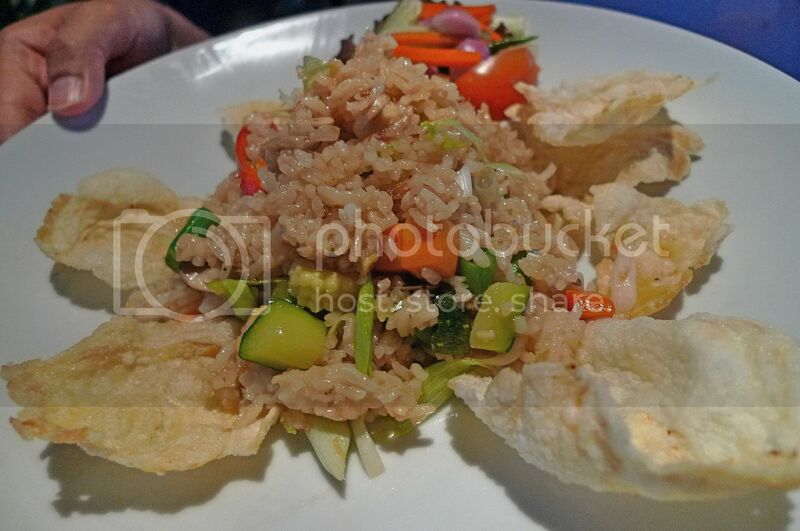 Thankz for the virtual tour and the pixs love 'em tQ. 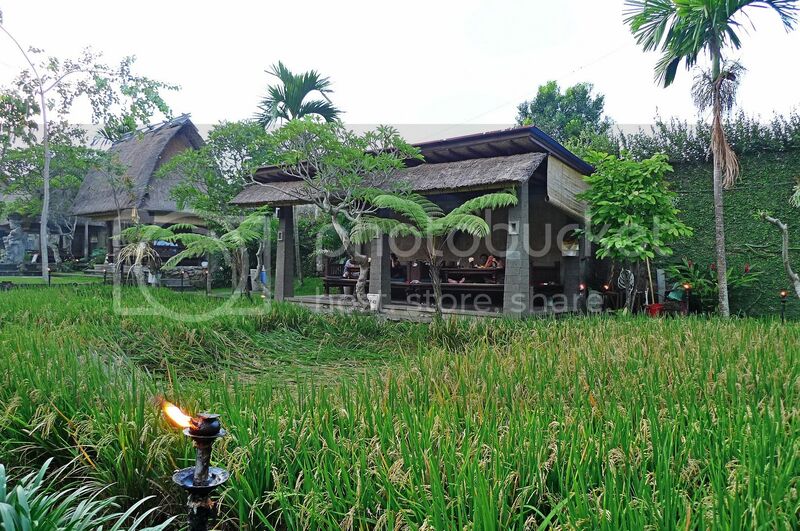 Is that paddy field in the restaurant surrounding? Wah! 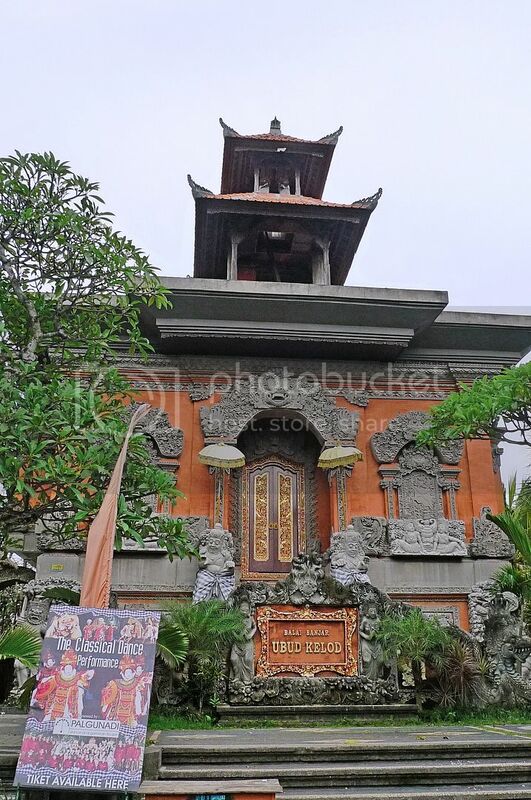 nice building stucture in Bali. The pool together with the make-shift raft looks very exquisite. :) A very clever idea. Wow...the statues are really gorgeous. I love the crocodile stools. Very adorable. Yeah! The ambiance is really comfy bro. 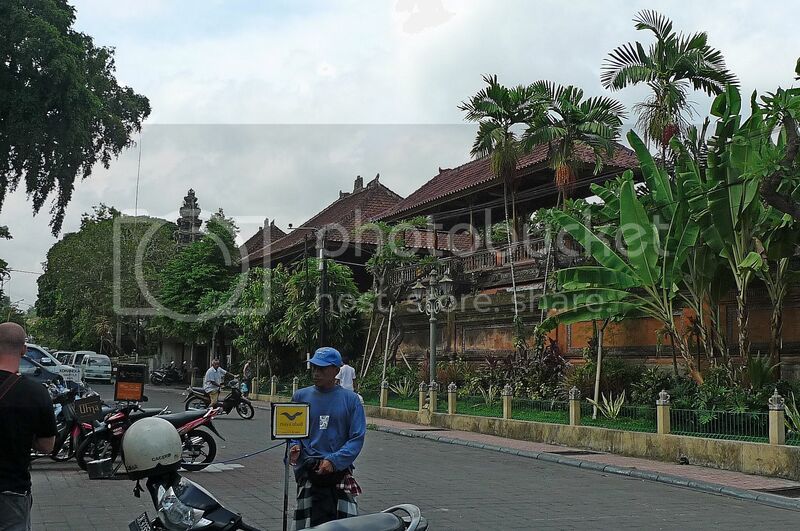 1st to go to Tanah Lot again, 2nd to eat the Smoked Duck again.. is there anymore reasons you wanna visit to Bali again?? 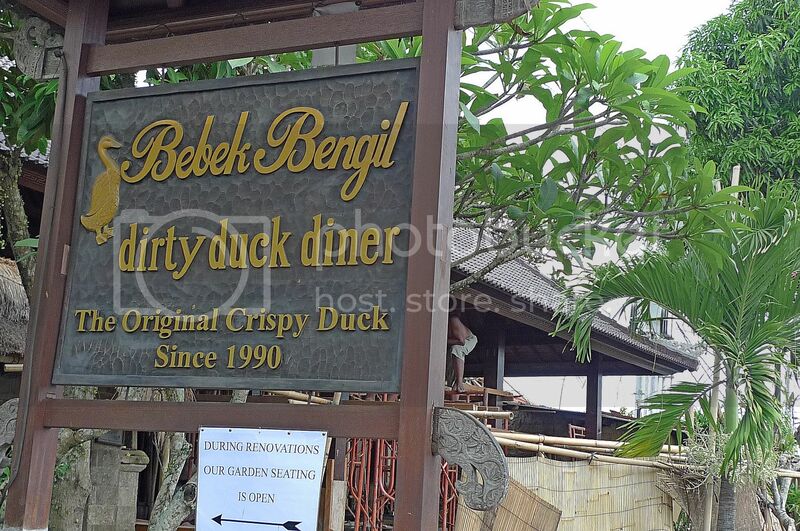 i see, this Bebek Bengil is just nearby the Ibu Ota that you had your babi guling..
hmmm, we also went to the same restaurant for the Dirty Duck!! i guess this must be the most famous, or the one that gives drivers the most commission to bring tourists?? i would guess so.. look at the decoration and ambience in the restaurant.. so touristy feel, and i guess no locals will be there to dine.. agree?? awww~~ so that's why they call it Bebek Bengil huh?? who told you that story?? 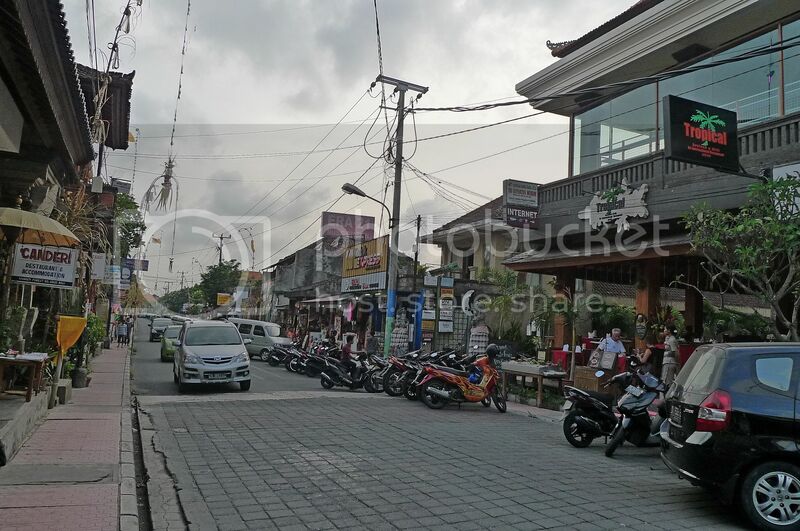 somebody local you met in Bali?? 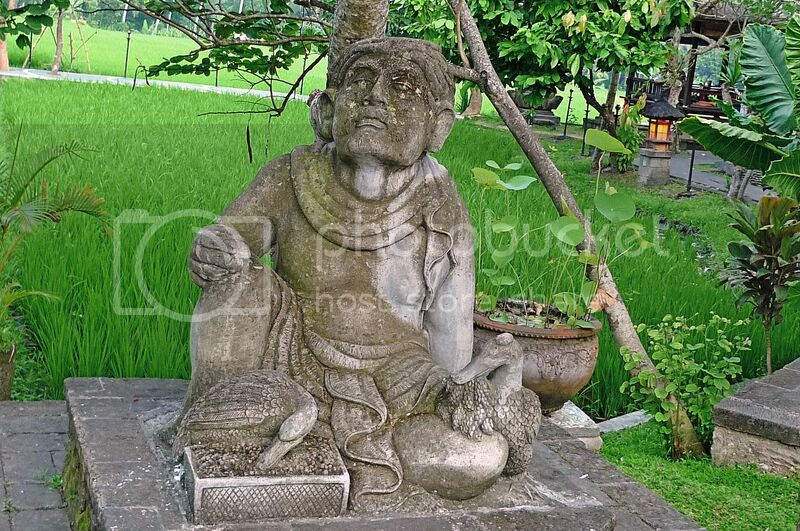 i don't remember much about all those stone carvings and statues.. but i remember the paddy fields there, it was huge!! and i remember the torches lit up to welcome the tourists.. and we kept camwhoring in the paddy field while waiting for the food to be served.. haha!!! has been more than 6 years, i can't really remember how the duck taste.. but i guess it was quite nice, very crispy and i was ok with that..
you know.. i dont like it when people come rushing to me saying "no no no no photos here, no no no" when i take photos at a no-photography place. Their satay is good. The crispy duck may not be that exciting, but the smoked duck sure was aromatic enough. Put a cigaratte in the crispy duck beak, then you will have a smoked duck! ha ha ha! This is my fav. 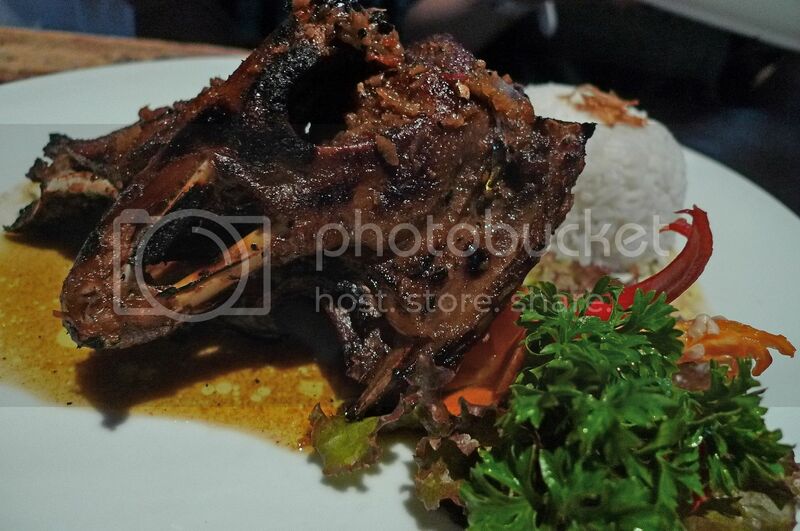 Bebek Bengil! Good value for money too! 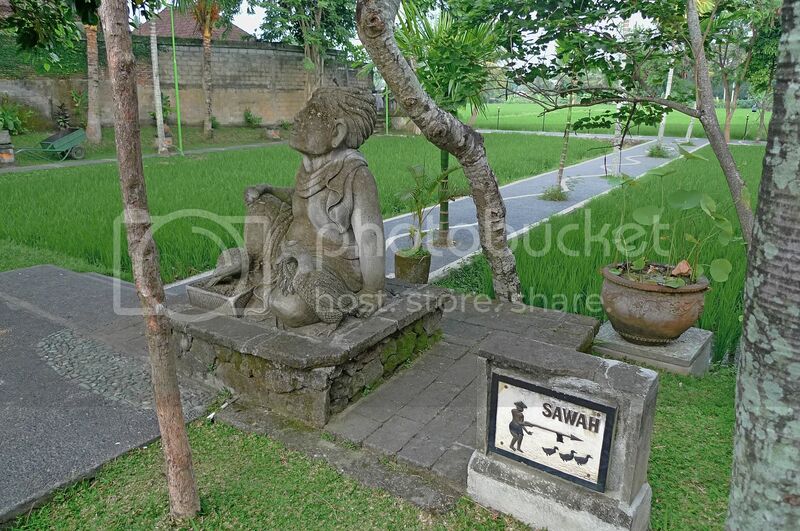 Nice place,statues and sculptures which you have shoot is really excellent. The dishes are seem very delicious which make me hungry. 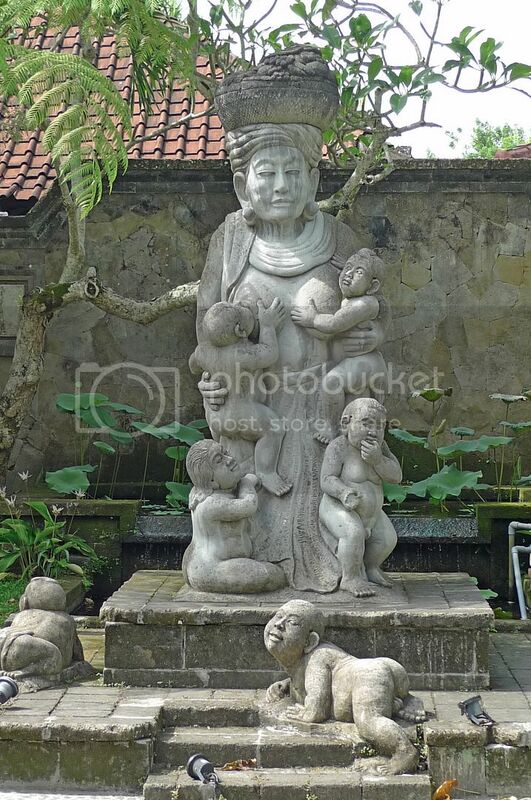 Statues and sculptures are really very nice. 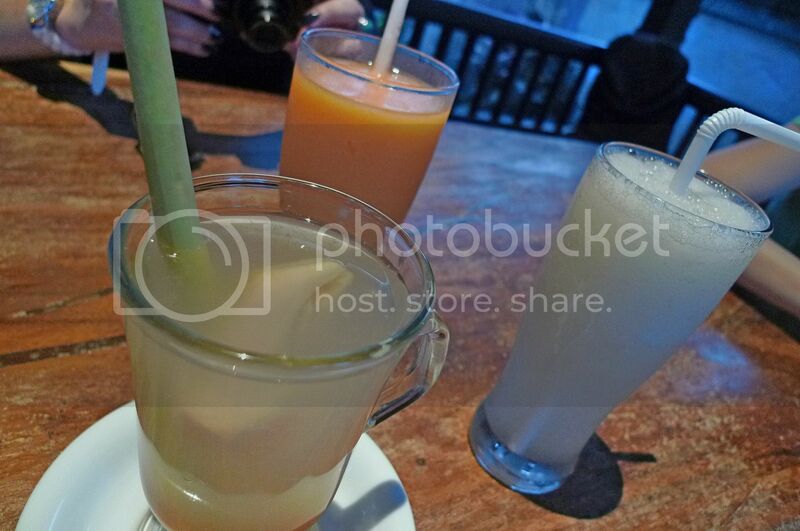 I love honey lemongrass drink. 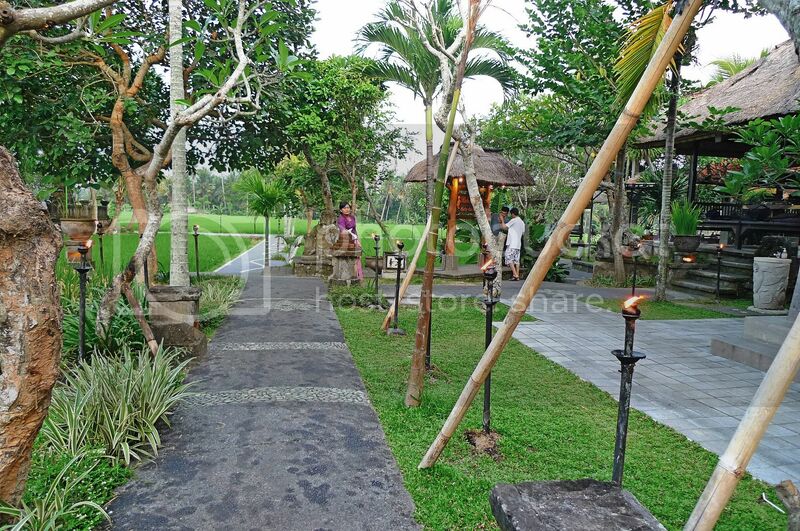 Nice landscape around the restaurant. 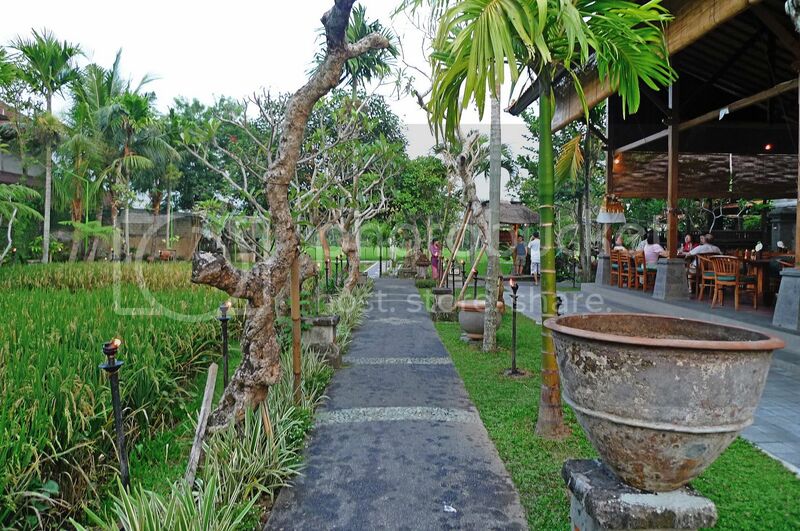 Nice restaurant with nice environment. The foods are looking too delicious. I hope you had enjoyed that place. Thanks, Foong, for sharing the pictures. I like the Monkey Forest Road first picture. 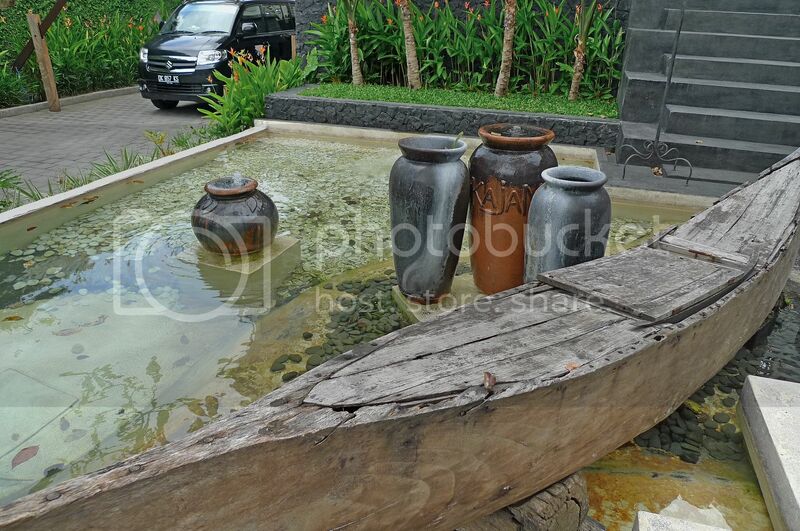 The place looks so serene and kampong-like Surprised that the road is paved with tiles instead of tarmac. The lily pond is lovely and that Komodo dragon looks so real. Thanks again for the virtual tour. 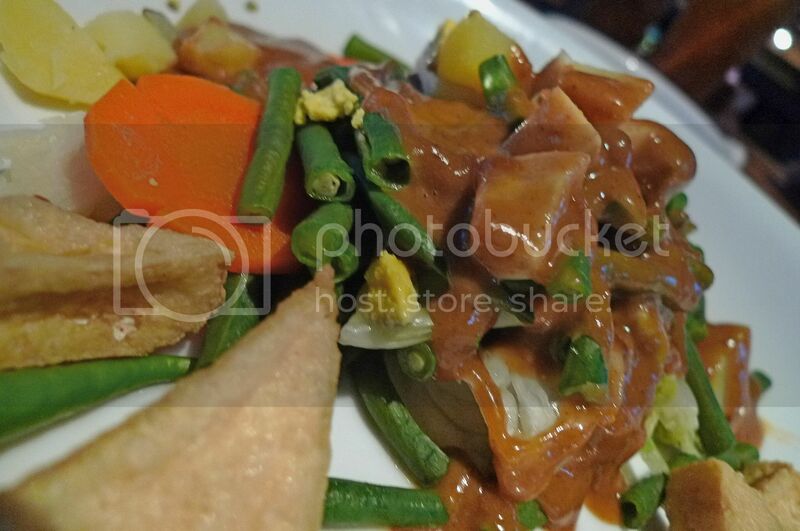 The duck looks yummy Foong! Glad u got to taste it while ur there. So where to next? fufu, oh they have upgraded? Too bad I didn't get to taste the smoked duck! The surrounding looks quite well decorated. 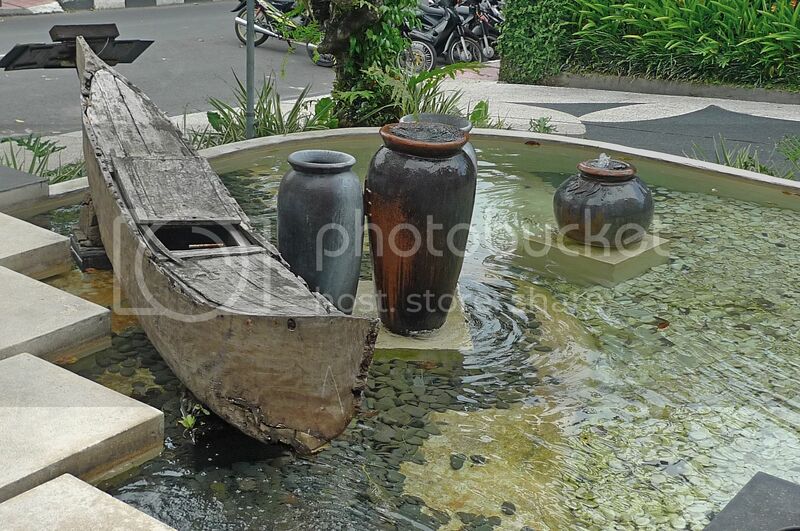 I really loved the lotus pond and the rock sculptures. But the name (dirty ducks) doesn’t really go with the surrounding. It is very depressing to know that you didn’t like the duck dish. Still I hope you enjoyed your time there. Bye and take care. 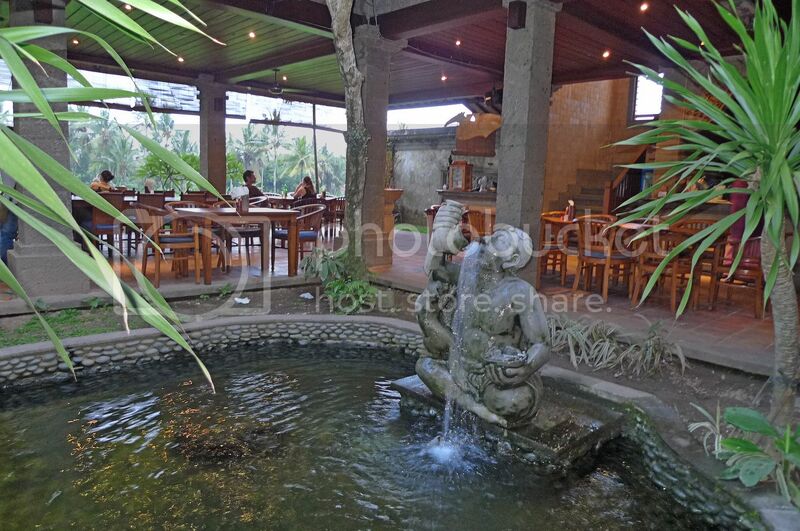 the ambience of the restaurant sure looks inviting and peaceful. 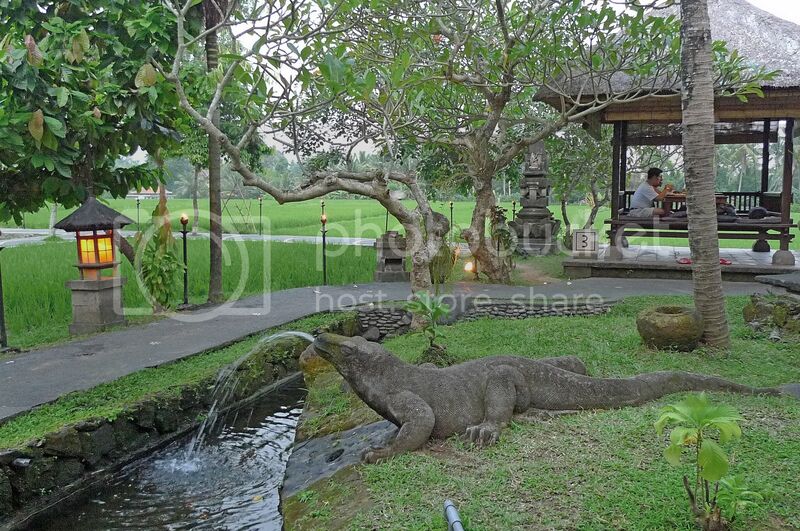 nice lotus pond but the iguana or komodo dragon looks kinda scary. 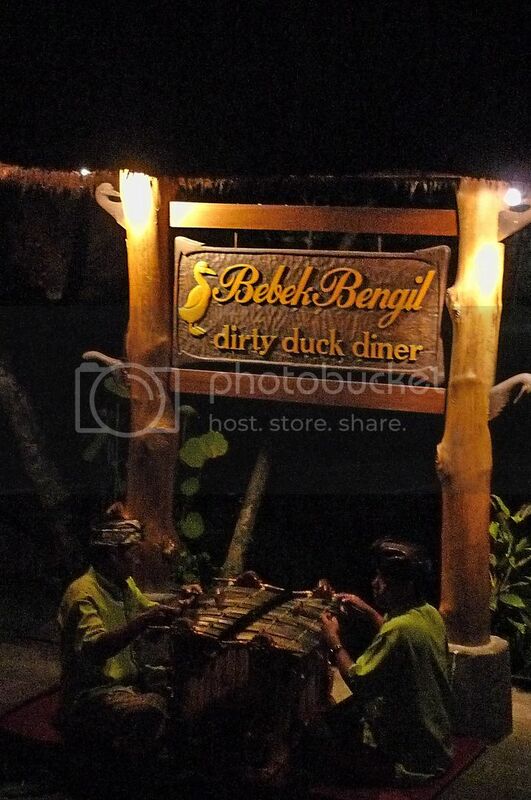 would like to try the smoked duck when i visit Bali someday. what a catchy but odd name for a restaurant! well at least we know now how the name was derived. Plan your next visit with me, ok? I am planning a getaway during the end of the year. Bali? nice, great stuff I found here. Thank you for sharing. Nice pics...liked your photography a lot.keep up the good work.